Brazilian duo Alison Cerutti/Andre Loyola Stein teamed up in June after splitting with partners Bruno Schmidt and Evandro Goncalves Oliveira. The pair has finished as high as fifth at the Warsaw Four Star on July 1, but has not been able to break onto the podium until now. No. 13 Alison/Andre will battle No. 6 Latvians Janis Smedins/Aleksandrs Samoilovs for the Moscow Four Star gold title on Sunday at 11:20 a.m. ET. The Brazilians will be looking for their first medal in their sixth tournament as a pairing. Smedins/Samoilovs, who have played together since 2013, are seeking their fourth FIVB World Tour medal and fifth overall including a runnerup finish at the CEV European Championships (July 22). The pair’s last gold came at the Espinho Four Star on July 8. The Latvians earned bronze medals at the Warsaw Four Star (July 1) and Fort Lauderdale Major (March 4). It was not an easy road to the final for either team. Smedins/Samoilovs went to tiebreak in the semifinals, missing two match point attempts before winning 22-20, 12-21, 20-18 over top seeded Russians Oleg Stoyanovskiy/Igor Velichko. In the quarterfinals, the pair rallied past Italy’s No. 4 Paolo Nicolai/Daniele Lupo (20-22, 21-18, 15-9). Alison/Andre bested Poland’s Michal Bryl/Grzegorz Fijalek 24-22, 21-13 in the quarterfinals and squeaked past countrymen Vitor Felipe/Evandro 17-21, 21-15, 15-11 to make the final. Velichko/Stoyanovskiy will look to give the home crowd something to cheer about in the bronze medal match against Vitor Felipe/Evandro. A podium finish would be the third of the year for the Russians, who won the Xiamen Four Star on April 22 and were runners up at the Doha Four Star on March 10. 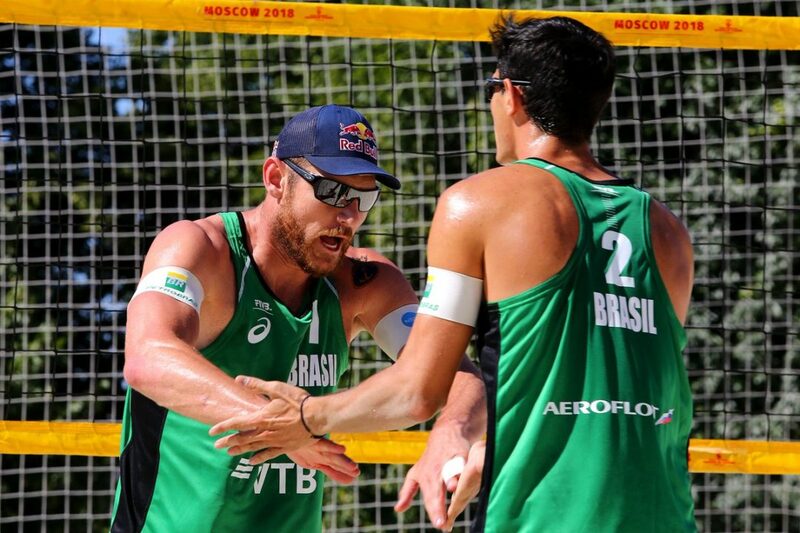 Vitor Felipe/Evandro are aiming for their second FIVB medal of the year since teaming up in June. The duo finished second at the Warsaw Four Star on July 1. The Brazilians were fourth at the Espinho Four Star on July 8.